The two American women who have broken the gender barrier to graduate from the Army's elite Ranger Training School are simply the latest to enter male dominated territories. An exhibition at the Museum of Art and Design (MAD) in New York, Pathmakers: Women in Art, Craft and Design, Midcentury and Today, recognizes women who broke similar barriers in the art world in the middle of the last century. It was pure delight to see early works by fiber artists such as Lenore Tawney, Sheila Hicks, and Anni Albers as they have definitely shaped and influenced my view of fiber arts. MAD connects the early days of these bold innovators with their influence on modern design. All but shut out of traditional media (Quick! Name three women artists! ), most of these creative women made significant contributions to modernism in what is now termed alternative materials--fiber, clay and metal. The exhibition, which is now open through Sept. 30, features beautiful and innovative textiles, ceramics and metalwork. Most of the women are American. Not surprisingly, I was most interested in the fiber. Beginning on the upper floor with works created primarily in the 1950s and 60s, the sense of continuity flows down to the lower floor that features contemporary artists and designers. 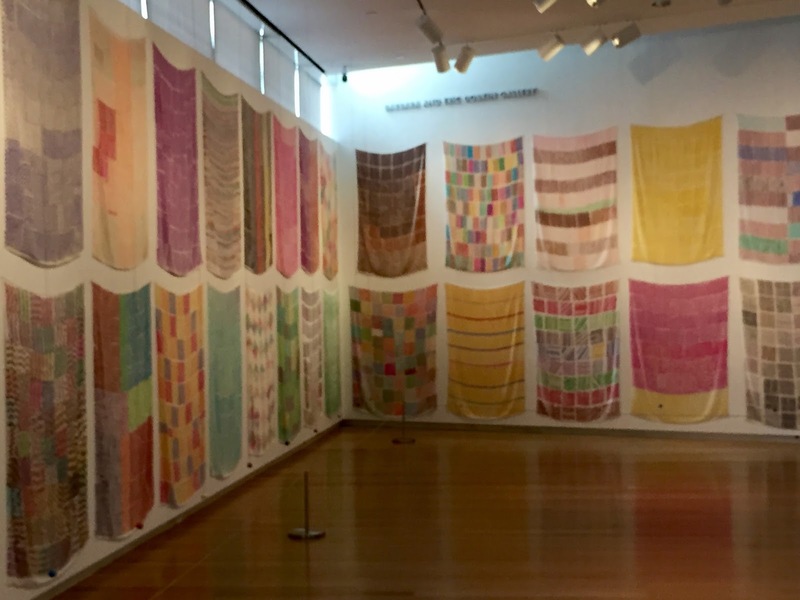 Walk down the steps to the lower level, as I did, to emerge from the stairwell to Polly Apfelbaum's dramatic installation that was influenced by Marguerite Davison's classic pattern book, "The Handweaver's Pattern Book." A photo cannot do it justice. Many of the textiles were clearly identifiable to the post war period mainly by the colors. But some are timeless. One example is an installation originally designed by Sheila Hicks circa 1967 for the Ford Foundation in New York and recently reconstructed. Made of linen, silk and plexiglass, the design is timeless. I had to look closely to see that the twisted circles are constructed of silk threads. Among the few garments in the show, I particularly liked the ruanas designed by Alice Kagawa Parrott. Commissioned by the Santa Fe Opera Company to be worn by their ushers, the simple and colorful garments seem a perfect 'uniform' for the annual Southwestern event. I did miss seeing work by Maria Martinez particularly since there are two ceramic pots by two women in the black-on-black style associated with her name. Perhaps because she worked with her husband? Or perhaps because she recreated and refined an ancient technique but executed them in traditional Pueblo shapes? I know. I know. Exhibitions like this can't include everything--or everybody. There are more than 100 works in the show, each very special. The show is well worth a visit. And here I thought only African or South Asians are the ones who indulge in fabric and textile work. Guess this exhibition proved me wrong.